A campaigner on the issue, Bishop of St Albans Right Reverend Alan Smith, called it a “generational scandal”. “Today’s findings by the Gambling Commission makes worrying reading and serves as a warning to parents,” he said. The commission also raised concerns that close to a million young people had been exposed to gambling through “loot boxes” in video games or on smartphone apps. Liz Ritchie’s son was a gambling addict who took his own life a year ago this week, aged 24. “It was because of deregulation that these machines came on the High Street so that Jack and his friends were able to gamble in their lunch hour,” she told the Victoria Derbyshire programme. Gambling Commission executive director Tim Miller called for a “joined-up approach” to keep children safe. 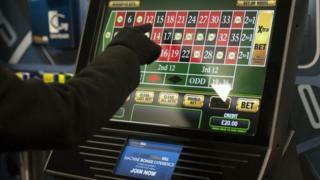 “There’s no doubt that today’s figures on children and gambling should make people sit up and listen,” he said. “The most common activities that children gamble on are not licensed casinos, bingo providers or bookies.